Much like tequila these past two weeks, cognac didn’t get much of a chance to shine during the past year’s worth of budget liquors. There’s actually a very good reason for that: most good cognacs aren’t going to fall within the budget booze range. Often considered “Ultra Premium” cognac is the sipping drink of the rich and élite. Particularly fond of cognac: rappers. As such, it isn’t too surprising that at least one decided to get into the cognac game. Chris “Ludacris” Bridges launched Conjure cognac several years ago in a collaboration with Birkedal-Hartmann. 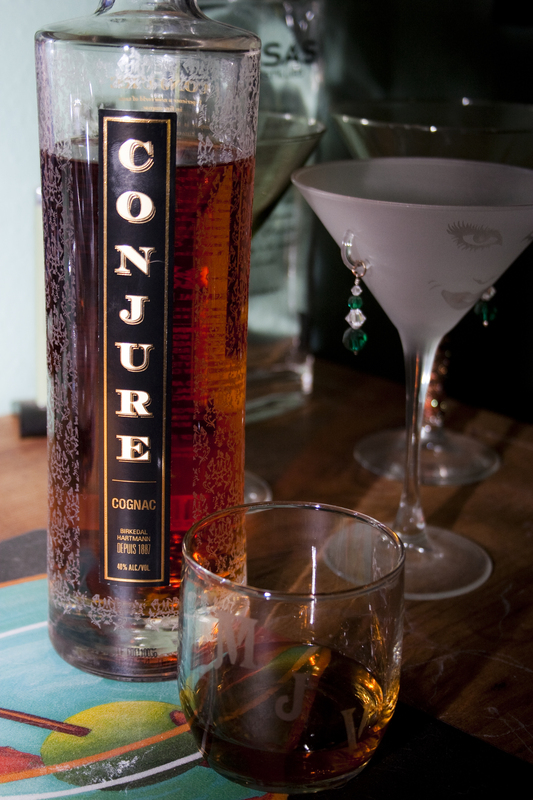 Handcrafted by Chris “Ludacris” Bridges, Conjure is made from the ugni blanc grape from blends that represent a variety of Cognac regions, including, Grande Champagne, Petite Champagne, and Borderie. A highly unique blend of both young and old cognacs, Conjure has been aged in fifty year-old oak barrels from Limousin, which can be found only in a boutique house. The combination of Conjure’s distinct blend and aged barrels provides an unparalleled complexity of smoothness, definition, and flavor. The first of its kind, Conjure features the full body and smooth finish of a quality French cognac combined with the mixability of a lighter spirit. Good friend and Cocktails, 365 contributor Josh Davis is the resident cognac expert. However, after we received our sample bottle from Conjure, I decided to make my own notes and then compare them with Josh’s. Strong wine grape scent right up front with some sugary notes. That is to say, in non-dickish terms, that smells nice. Fruity with a wine-like finish. There’s no unpleasant aftertaste. Disappears on the end. Not nearly has heavy as some other high-end cognacs we’ve tried. A much more delicate flavor than you would expect from cognac. There’s a smoothness to it that is very nice, but you lose some of the “oomph” that you get while drinking it neat. So what did Josh have to say? He called it a solid mixing cognac. We’ll test that over the next two weeks!